Afterworlds is two stories told in alternating chapters. In the first story, Darcy Patel just graduated high school and she's managed to land a literary agent, a huge book deal from a New York publishing house and enough life changes to make anyone's head spin. Determined to be a 'real' writer, Darcy moves to New York, leaps into the literary scene and struggles to figure out who she is as a person and a writer. The second story is Darcy's soon-to-be-published novel, Afterworlds, in which 17-year-old Lizzie survives a terrorist attack by playing dead so convincingly that she falls into the afterlife and meets a hot Vedic death god. When Lizzie returns to the world of the living she discovers that she can see ghosts and that everything about her life has changed. Torn between her mom & friends on one side and her hot Vedic death god on the other, Lizzie tries to get her life in order. This book is a perfect example of meta-fiction (fiction ABOUT fiction). It's basically a very long and tongue-in-cheek ode to the YA writing community, the book publishing industry, the YA reading community and life as a young adult living in New York for the first time. It's one part satire, one part love note to an industry Westerfeld has been entrenched in for years and one part literary romp. I loved it, but then I'm a bit biased as I love most of Westerfeld's books. I was equally enthralled by Darcy's story and Lizzie's as well. Lizzie's story is your typical paranormal romance with the foibles and pitfalls therein. But the characters really came to life for me and I fell in love with all of them. Darcy's story on the other hand made me want to run away to New York and discover a new city for the first time. It made me long for YA Heaven and hanging out with other authors at YA drinks night. Little details like Imogen's collection of matchbooks fascinated me and brought the characters to life. This was a very long book and yet I flew through it and in the end it wasn't long enough because I would have kept reading quite happily. Westerfeld is at the top of his craft and a master at bringing a scene to life. Take these two lines for example, describing a kiss: "Their lips met, and she breathed in the scent of the sun-heated tar beneath them and the salt of Imogen’s skin. She felt the rumble of the traffic below traveling up through the building and into her spine, her fingertips, her tongue." In just that tiny space Westerfeld vividly brings a kiss to life with scent, taste and tactile description and it's so beautifully done. Afterworlds is filled with scenes like this that leap off the page and feel so achingly real. Unsurprisingly, the book has drawn some harsh reviews and some pissed off people. I figure those people probably haven't spent much time in YA land wallowing amid the books, following authors on Twitter, YouTube, at conferences and book signings. Their loss. For anyone who has, you will recognize aspects of your favorite YA authors in these pages and get a fascinating glimpse at one aspect of the publishing industry. That isn't to say this book is perfect. A few reviewers are howling about how unrealistic Darcy's story is, in regard to her publishing experience. That is a legitimate gripe. I attended a book talk by Westerfeld just after Afterworlds came out and he said that he and his friends know young authors like this who get fabulous book deals. He also told another attendee that it's not that hard to get a literary agent. Here's the thing guys, Westerfeld and his friends, at this point, are like YA royalty. They're part of a group of highly successful authors and they've been publishing for years. The book market today is light years different than it was just five years ago even. I am certain that the young authors Westerfeld meets, and therefor those he partially based his book on, do get fabulous crazy deals, but he's meeting them because they are the outliers and not the typical debut author. The hard truth is, getting a literary agent is tough and it takes luck, talent and persistence. Six figure book deals use to be, if not common, then at least not scarcer than hen's teeth for a debut author. These days, however, most authors have day jobs and don't earn enough from their writing to write full time. A $15,000 advance is far more realistic than a $300,000 advance. However, as I said, their are always exceptions and Darcy is one of those - she gets lucky, basically. 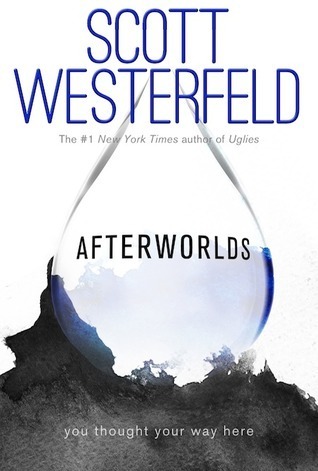 It still happens, even in today's publishing world, so those critics howling at Westerfeld should perhaps calm down and read the book again because it's a fantastic piece of fiction that deserves to be read several times. I think that Afterworlds may encourage a lot of young writers and that's never a bad thing. In the end, this book is fiction after all and as far as I'm concerned it accomplished its main goal: it entertained, enthralled and dragged me into another world. Two of them as a matter of fact. I'm not complaining about the journey. Afterworlds will appeal to fans of John Green, Maureen Johnson, Gail Forman and YA books in general. There's something here for most YA readers. Favorite line(s): "Mindy had explained that a lot of things had ghosts, not just people. Animals, machines, even things as vast as a paved-over forest or as humble as the smell of good cooking could leave traces of themselves behind. The world was haunted by the past."